I am pleased to announce the publication of a new monograph, probably one of the most important things that I have ever written. It is a comprehensive study of a very short section of Gemara, just five lines in Pesachim 94b, a passage which is so obscure that most people just skim through it with little comprehension. Yet when the terms used in the Gemara are clarified, and the views of Rishonim and Acharonim over the centuries are surveyed, the results powerfully illustrate the radical transformation that has taken place with regard to how Jews view the Sages of the Talmud. Furthermore, the positions of Chazal about cosmology which emerge from this discussion prove critical to certain other topics that I shall be raising in the future, as well as to my review of Kolmus. The recommended donation is $5, but if you would like to take this opportunity to support this website and my writing in general, that would be appropriate and appreciated. With my monograph on Shiluach HaKein, I only made the download link accessible to those that made a contribution (which resulted in a far higher number of contributions than I received for my Kezayis essay). The reason why I am not doing that in this case is that I do not want anyone to avoid downloading it because they don't wish to make a contribution, for whatever reason (such as that they do not want to reveal that they read my material). It is important to me that this essay is read as widely as possible; the sources that I have accumulated powerfully show how the views of legitimate approaches to Chazal and mesorah that are held by the Charedi Gedolim who banned my works are completely at odds with the facts of Jewish history. Furthermore, this monograph shows how the Charedi misunderstanding of the "mesorah" evolved. If you ever find yourself confronting someone who insists that there was never a traditional view that Chazal's statements about the natural world were human and fallible, then this brief section of the Gemara, with all the sources in this monograph, is all that you need to demonstrate their error. One of my greatest regrets is that I had not adequately researched this section of Gemara at the time of the controversy over my books; had I done so, I would have been able to present a much more powerful case! In fact, can I distribute it freely or not? Good point. Look, ideally I want people to pay for it, but many people are never going to visit this website and/or will never pay for it, and I still want it to be read by them. So if you can refer people to this website, great, but if not, I would still rather it be passed on to them rather than not read by them. In any case, people downloading it here are those who benefit from this website in general. I was glad to see Andre Neher in your bibliography. If you haven't seen it already, you might want to skim through the articles in Jewish Thought in the Sixteenth Century, ed. Bernard Dov Cooperman. Harvard University Press, 1983. "Extensive efforts went into the research and writing of this monograph, and as a result, I am not making it available for free; "
After reading your comment from 6:18 AM, I think you may wish to reword the last phrase above. Something like, "I would prefer not making it available for free, but..."
I paid and encourage everyone else to as well. What if I'm a bit strapped for cash right now? ben Uziel – During the second Beis Hamikdash when the leaders were allowing the Kehuna to be bought and sold to the highest bidder, was it “right for the klal” because the leaders were in the majority and it was “the most accepted view” at the time to allow this? Was that also “a sign from the Ribono shel olam” guiding the “leaders through a process of hashgacha”? I agree with ben Uziel. The united gedolim are a clear sign from the Ribbono Shel Olam. One could argue that it says that the Seal of HaShem is Truth. Truth, not "halachic process" or "unified corpus of halacha". But there is no Stira: The halachic process has the power to determine what is Truth. Shma Yisrael. Listen to Psak. We are not like these idol worshippers who think that there is truth beyond Psak. Do we still need mayim shelonu? Sounds like ben Uziel conflates halacha with hashkafa. Aside from that, I was not aware that current Jewish leaders actively sought out halachic unification. I await the chassidim to commence davening shacharit within the zman tefilla and to commence eating gebrukts. Oh, that didn't really happen? So you are correct that there were times in our history where the leadership allowed things that shouldn't have necessarily been allowed (which is apparently the case during the 2nd temple). Can't say for sure, however – perhaps it was l’sheim shamayim and objectively correct (despite the fact that they were Tzadukim)? By the way, I'm not sure how to totally explain the hashgacha in that situation, but HKBH allows people to use their bechira and He let them use their bechira in such a way as to warrant this phenomenon - and there is always a reason for the hashgacha that happens at any point in history, as it is all part of the "grand scheme" (the "masterplan" that HKBH is in charge of) - He could have prevented it from happening by changing the nature of the thoughts of the Tzadukim back then, but he didn’t. At least we can say gam zu l'tova in the end of the matter. Good point though. I'm interested in hearing more of your thoughts. Student V - What views are permissible to maintain is a clearly an halachic matter. This is why certain views are allowed to be deemed mutar or assur. Secondly, regarding your comparison to Chassidim, it is irrelevant in this case because Rav Elyashiv holds that the principle of rov *in this case* even applies to communities with different mesoras (usually it does not). To clarify what I have been saying: The revelation of kabbala has given us a new dimension into the wisdom of Chazal's scientific statements - that they could be based on kabbalah. This view has gradually become more widely accepted amongst the majority of Jews throughout the world. Therefore, the conclusion of today's leaders is that the power of many of the previously held views of Chazal's scientific statements (made by various Rishonim and Acharonim) has slowly dwindled. However, they may be relied upon b'shas hadchak (kiruv for example), but cannot be held by the Jewish community at large. Again, the *attempt* to create a unified corpus of halacha is our goal, and that is precisely what our leaders are striving for, just as the leaders of Jewry have done throughout the years - "halacha k'so-and-so" etc. "The overwhelming majority of leaders nowadays - clearly a sign from the Ribono shel olam, who guides our leaders through a process of hashgacha in deciding what is right for the klal" are not Charedim. In fact, they're not even "Orthodox". Do you see any problem with your argument? Or will you continue to justify your minority viewpoint by excluding everyone in the majority whose opinion is out of fashion with your chosen gedolim? has led the leaders of our generation to decide that certain views should not be maintained anymore, despite the fact that such views were once widely held. And those who follow those leaders, must follow this dictate. However, these are not the leaders of all Klal Yisrael. If you want to believe that, fine, but there's no reason that others would be compelled to do so. the mistake you are making is to compare their leaders to ours - the Kohanim from that period were primarily Tzadukim (see Tosef., Yoma 1:8). Are you suggesting that today's leaders are in the same category? G-d forbid. However, they are ignorant of the relevant views of the Rishonim and Acharonim. Rav Elyashiv holds that the principle of rov *in this case* even applies to communities with different mesoras (usually it does not). I never heard that he said any such things. Nor would he have the authority to do so. An attempt to make it obligatory to believe that all the Rishonim had a fundamentally perverted view of Chazal? Out of fashion? We are talking about people who wear designer frocks (probably not from gap or banana republic, though)! But seriously, the "chosen gedolim" are not chosen, but have proven themselves over the course of decades - through their experiences in dealing with people and their vast Torah knowledge - to be trusted figures in paskening the most difficult issues. Read Reb Moshe Feinstein's or Reb Yaakov K's biography and you'll see what I mean. In fact, there's even a bio of Rav Elyashiv already. His sichas chulin is remarkably measured and made with references to kol hatorah kula. Those who critically analyze his teachings in his public shiurim, trying to stump him and ask the most difficult questions discover that his rulings are based on his total mastery of Shas and Rishonim, including the most obscure teshuvos seforim. If somone who is a moreh horaah who feels he can disagree with him would argue, I would understand him. But even so, someone who has not mastered Shas and poskim cannot argue with him. If your Rav is a yirei shamayim and you follow his psak and are not wishy washy (picking and chosing from what he says), then if he says you can read material that the leaders say the majority should not read, then you can, because these views, again, can in fact be relied upon bshas hadchak (as is this case with many yesh omrim opinions) - this is an halachic issue, Gary. Lechatchila, however, we shouldn't transmit our approach to Chazal this way any more, according to the majority of our generation's leaders...who wear designer frocks. -Granted, every town has their own leadership, as well as every yeshiva. However, the leaders I’m referring to represent the vast majority of klal yisroel’s primary leaders – the “big guns”. This is a fact based on whose Torah knowledge (and most importantly their application of it) has proven to be superior over the years and decades. -So some people feel there is no hashgacha here? What else is it, lack of hashgacha? HKBH is constantly guiding us, right now as you read this, in the direction of the 3rd beis hamikdash. I’m sure you agree with this. But that there’s no hashgacha in the leaders making this decisions? I’m not claiming ruach hakodesh, but simply hashgacha. -I heard this from a Rosh Yeshiva who frequently speaks with him. I trust his word on it. Secondly, it’s not about whether or not he has the authority to do so - he is simply following a specific way to apply the halachic principle of rov (and when not to apply it). -Chas v’shalom. (And *all* the rishonim? Didn’t know that was true.) Basically, today’s leaders are not claiming or even trying to imply that these great scholars erred or perverted Chazal. They are simply claiming that, halachically speaking, these views should not be adopted anymore (for various reasons, some of which I’ve hit on a bit) except bshas hadchak – halacha k’so-and-so, but bshas hadchak you can be somech on their “outdated” views (i.e. their views that have gradually become less accepted over the past few hundred years or so). "have proven themselves over the course of decades - through their experiences in dealing with people and their vast Torah knowledge - to be trusted figures in paskening the most difficult issues." Yes... the way that they vested so much power in Leib Tropper certainly proved heir trustworthiness. And the way that they banned the Lipa concert one year, and said that there was no way it could be made kosher, and yet the next year it was fine! "Big guns" is not a halachic concept. Nor is "primary leaders." Furthermore, many people would dispute whether the figures in question have proved to possess superior Torah knowledge, and certainly its application. But that there’s no hashgacha in the leaders making this decisions? I’m not claiming ruach hakodesh, but simply hashgacha. You can say that there's hashgachah in everything. Maybe there's hashgachah in the fact that, in the opinion of many people, my arguments were devastatingly powerful vis-a-vis the Gedolim's arguments? Maybe there's hashgachah in the fact that the main figures involved in engineering this Daas Torah turned out to be criminals and suffered a downfall? -How do you know this? You asked them? What did they do when learned those gemaras – skip over the relevant mepharshim? But how else did they become such great scholars – from skipping mepharshim? Other people asked them. They indeed did not know the relevant sources, and suggested that the sources were forgeries. They became great Talmudists and halachists, but not remotely experts in the approach of the Rishonim to such topics. Look, you can do the Pesachim 94b test - ask them how the mefarshim explain the sugya. They'll quote Rabbeinu Tam and Maharal, and they won't have heard of the rest. IF he said it, he's entitled to his view, and other Poskim are certainly entitled to completely dismiss it. It would be an absolutely groundbreaking pesak with no precedent whatsoever. Basically, today’s leaders are not claiming or even trying to imply that these great scholars erred or perverted Chazal. Sure they are. They say that Chazal's words were all Torah miSinai, based on ruach hakodesh. Someone who thinks that they were just human assessments that were in error thus has a fundamentally perverted view of what Chazal are all about. Rav Moshe Shapiro and Rav Wachtfogel have been very explicit about this. Doggett-I think you are missing the point. If you would look at the positives (and they are endless) and judge favorably on what *seems* to be negative, you would probably agree with the points I'm making. By the way, do you judge beinonim favorably? For sure we should judge talmidei chachomim favorably. And even if they were possibly mistaken - but who are we to judge - you are isolating a couple questionable decisions while ignoring their myriad of amazing acts of mesiras nefesh - answering calls around the clock, sacrificing materialism for torah and mitzvos, doing uncountable acts of chesed, loving and caring for klal yisroel's well-being, awakening early to learn Torah, staying up late at night to help with tzibur issues, etc. I'm not ignoring their acts of mesiras nefesh. But that has nothing to do with good leadership, wisdom and reliability. And of course the other point is that in this very decision - their "Daas Torah" on my books - their info about my books and their effects came from three confirmed liars - Tropper, Pinter and Schmeltzer! Gotta love the fashion jokes! I don't think the scientific errors of Chazal are, in the case of this paper, halachic. However, I think R. Slifkin does just as you request of a leader. That is, he selects his samples from the elite body of writings that you require and shows that Chazal, themselves, find that they have made scientific errors. So to claim that the paper is meaningless is simply not the case...according to your own definition of what counts. Given this paper, what compelling reason could a rav have of denying access to information from the modern scientific era? I think the body of R. Slifkin's paper makes this point rather elegantly. It demonstrates there is no halachic difficulty accessing modern scientific information indicating that the expressed scientific conclusions of previous Torah authorities have been superseded. -we would all do justice to this dispute by sitting down with Rav Elyashiv. Since this is not practical, let’s keep debating. -Let me make myself more clear. I was not claiming that big guns or primary leaders is an halachic concept. It makes no nafka mina. I was simply explaining how they likely became leaders. Secondly, who exactly would be presumptuous enough to dispute the leaders’ superior torah knowledge and application of it? Did you see what I wrote about Rav Elyashiv for instance? Maybe there's hashgachah in the fact that, in the opinion of many people, my arguments were devastatingly powerful vis-a-vis the Gedolim's arguments? Maybe there's hashgachah in the fact that the main figures involved in engineering this Daas Torah turned out to be criminals and suffered a downfall? -To make your conclusions you need to administer a thorough test of several of the leaders. (Otherwise it is not a credible experiment.) Has this been done and documented? It’s very hard imagine that individuals such as Rav Elyashiv and others would not have learned or at least heard of several of these sources. At any rate, the sources are pretty much irrelevant based on what I’ve explained thus far. Besides, their general depth and breadth of knowledge and their ability to apply it is superior. -juggling multiple priorites, dealing with communal issues, psak halacha, etc. consistently throughout the years (and being respected and commended for their jobs well done) are acts of mesiras nefesh and proclaim their “good leadership, wisdom, and reliability”. my main point is still valid. -doesn’t mean they lie about everything…regardless, the daas torah of Rav Elyashiv, for instance was checked independently in this case and was not based on strictly these three individuals. my main point is still valid. I was simply explaining how they likely became leaders. Secondly, who exactly would be presumptuous enough to dispute the leaders’ superior torah knowledge and application of it? Besides, the nisayon is precisely who should follow who – should we follow the great chachomim of our dor or a small group of intellectuals who do not match up in depth and breadth of torah knowledge and its application? V’ha’emes nederes – who is right? You can only err by not following the leading experts of the dor. This is all common sense. It’s very hard imagine that individuals such as Rav Elyashiv and others would not have learned or at least heard of several of these sources. At any rate, the sources are pretty much irrelevant based on what I’ve explained thus far. Besides, their general depth and breadth of knowledge and their ability to apply it is superior. regardless, the daas torah of Rav Elyashiv, for instance was checked independently in this case and was not based on strictly these three individuals. -i didn’t claim anything about the paper. I think I stated something like the sources are irrelevant to the leaders’ decision in deeming these views shas hadchak. paper makes this point rather elegantly. It demonstrates there is no halachic difficulty accessing modern scientific information indicating that the expressed scientific conclusions of previous Torah authorities have been superseded. "You can only err by not following the leading experts of the dor." Rav Ovadia, in his hubris, said something very similar when praising Rabin for listening to him regarding the Oslo agreements. More than a thousand died as a result, and myriads were wounded and maimed. It's not easy to get an audience with Rav Elyashiv and all the others - I guess they realized that this was an important case. And it's good that they had the wisdom to send him to Rav Batzri, who they trust as an expert on such things, and not one to be fooled! That's odd, some of the last comments disappeared. I don't know how that happened. -how do you know there's no precedent? i have mekoros for it! >>>> This process of halachic unification has led the leaders of our generation to decide that certain views should not be maintained anymore, despite the fact that such views were once widely held. Wow, you destroyed the whole concept of “mesorah” in one sentence. ROTFL …. Like in the 1930’s warning against Jews trying to make aliyah “because it was assur gomur”. 2. Superior understanding how the world functions physically and sociologically. 3. Feel the needs and the pain of his community. And, except for #1, your Gedolim will never be my Gedolim. Question: Are you claiming that the Chazal were prophets...or maybe some of them were prophets? Or maybe you're saying that when the Talmud went through its collections and redactions, it was guided by HaShem in a way such that the final text would produce an ever-changing/time-relevant revelation of what He wants? Or, perhaps, that the Shulchan Aruch and subsequent codes went through the above processes? You also seem to be saying that throughout history [or at least history since Chazal?] status quo is a sufficient criterion for determining Divine Will [in halacha only or more generally?]. Am I getting this right, partially right, or [behind the third curtain] completely wrong? "And those who follow those leaders, must follow this dictate." Really? That's kind of not so "rationalist." "-juggling multiple priorites, dealing with communal issues, psak halacha, etc. consistently throughout the years (and being respected and commended for their jobs well done) are acts of mesiras nefesh and proclaim their “good leadership, wisdom, and reliability”. my main point is still valid." Unfortunately, there's no time to go through the tremendous amount of faulty (often circular) logic in your posts, but I think this point deserves further clarification as it relates to the whole cult of godol worship. There's very little evidence that the "gedolim" have done anything positive for klal yisrael in decades. They've managed to protect child molesters, encourage reliance on public welfare (and often, as the rambam warned, accompanying theft), outlaw scientific fact, and generally make Judaism look foolish and morally reprehensible. When I try to think of the wise communal decisions they've made, I can't think of one. The fact that many of these "leaders" work hard is irrelevant. Typically, it does indicated a certain industriousness and commitment but is certainly not evidence of “good leadership, wisdom, and reliability.” No doubt that in many instance there is some "mesiras nefesh" but less and less of that as the years go by. There's always been honor to talmidei chachamim in our community, but today they alone are worshiped and the honest working man denigrated. What does an intelligent, ambitious, honor-seeking individual in yeshiva today desire more than becoming "a godol?" And this is impossible; it is also contradicted by the senses, for the sun only sets from the horizon; it does not set [at that time] for those that have a different horizon. And this cannot be contradicted by any intelligent person. Maharal’s rejection of the straightforward understanding of the Talmud on the grounds that it is “clearly impossible” is based upon an anachronistic view. The truth is that something which appears “obviously” false in one era does not necessarily appear false to people in another era. Can you please elaborate on this - I am not sure what you mean here . . . Very interesting monograph, I enjoyed it, but I think you may have erred when you assumed that Rabbeinu Tam's two shekiyah approach is predicated on the Sages of Israel approach. While this does seem to be the opinion of some Acharonim, I encourage you to see Tosefot Rid's approach where he takes an identical approach to Rabbeinu Tam. (Shabbat 35b) In the end of his commentary he mentions that he has seen Rabbeinu Tam's writings and that his opinion is the same as Rabbeinu Tam's, but he chose to describe it based on the approach of the gentile sages and Rabbeinu Tam described it in the Sages of Israel system. It is clear that he felt that while Rabbeinu Tam utilized their system to describe his approach, it was not dependent on it. -don’t see why. The influence of kabbala, as I’ve pointed out at least once already, is part of mesora as well (just like the views that are no longer permissible to hold – once again, lechatchila that is. In other words, it’s all about what is permissible within the mesora *based on the changing conditions* that eventually require halachic unification. -I’m not such an historian, but people are human, and fallible. *But*: that doesn’t mean we dismiss the views of great minds in every situation. We take each situation on its merits and in this case, as I’ve explained multiple times, there are solid and logical reasons to follow the leaders. -I don’t see why #2 is a requirement. Did Moshe Rabbeinu do this? Did the great prophets? The tannaim, amoraim, geonim, rishonim, etc.? I would be very surprised if the majority did. Also, I don’t see why number #3 you reject. If you knew about their numerous acts of chesed performed day and night, and were not so pessimistic and cold toward the great chachomim in our dor, you would conclude differently. Hey gary. See Urim v’Tumim (Choshen Mishpat 25: Kizur Takfo Cohen; simon 124, end, “v’lo daati” and note 162), who basically says that once certain shitos have been universally accepted, they unquestionably provide the definitive basis for all psak halacha. Therefore, an individual - even if he is well-versed and has many questions, even if he is an expert in halacha - is NOT permitted to paskin halacha according to other [unaccepted] opinions contrary to the majority psak. Without a doubt, if something has been accepted by gedolim & yirei shomayim then it was with unequaled, exceptional siyata d'Shmyah. As an endorsement of such halachic efforts, the Urim v’Tumim cites the posuk in Devri HaYomim (I, 28:19) “Everything is written by yad Hashem — that I should understand all the intricacies of the plan.” With this statement, the Urim v’Tumim certifies that everything accepted has been written with the direct guidance of Hashem. He goes on to describe the enormity of the task that gedolei hapsak set out to accomplish. They have the fortitude to assert their views based on kol HaTorah, culled from the collective works of all the Rishonim and Achronim. They had to persist and not let demanding decisions overwhelm them. They succeeded only by the fact that “Ruach Hashem dwelled within them and elevated them, so that their words should correspond to the halacha, [even] without their purposeful intent, for it is Hashem’s desire that they be successful.” Clearly, HaKodosh Boruch Hu insures that Ruach Hakodesh will be with those who honestly and sincerely, with yiras Shomayim and because of yiras Shomayim, set out to determine halacha in a truthful manner. Therefore, the Urim v’Tumim concludes, “Chas vesholom to claim that ‘I am convinced [that the psak is different] contrary to [what's accepted].’” Since the Shechina speaks through the mouths of such great outstanding poskim we cannot consider disputing universally accepted shitos. See also Taz yoreh deah 92:27, end. Chavos yair 263 side b in the hasmatos, siman 165. shailos teshuvos chasam sofer even haezer V2, 102, and choshen mishpat 148. birkei yosef, choshen mishpat 25:27-28. shailos teshuvos rav poalim V2, choshen mishpat 3. nesivos hamishpat 25:20. there’s like 10 other sources but don’t have time to type up. "once certain shitos have been universally accepted, they unquestionably provide the definitive basis for all psak halacha." That's odd, because it was universally accepted amongst the Rishonim that Pesachim 94b was a scientific discussion about astronomy, and yet that didn't stop people from subsequently claiming otherwise. Or, to put it another way - it's strange that you claim that the Shechinah speaks through the Gedolim, but it didn't speak through the Rishonim! -it once did, but the influence of kabbalah changed the whole scene. So it spoke through them, but it told them the wrong thing? "So it spoke through them, but it told them the wrong thing?" Then it was right, but now it is wrong. A case of common sense. An example from a different realm may illuminate this: The world used to be very old, but now that it has been paskened that the world is less than 6000 years old, HaShem has no choice. He has to have made the world only recently. Nitzchuni Banai. So, now L'chatchila we cannot say that the world is ancient. Of course, B'Shas D'chak we still can. It is all common sense, really. >>>>>-I don’t see why #2 is a requirement. The very fact that you fail to see the vital importance of #2 tells me that we simply do not live on the same planet. The reason is because the fact is that the overwhelming majority of halakhic questions involve competing ideas maybe between hashkofot, maybe involving science and religion and then the need to know how to resolve these competing tensions. Or in community affairs, for example, (and this is only one of many) the issue of women in Judaism is a very crucial discussion and without understanding “women” and how their roles have changed and their minds function, I don’t see how a posek can possibly provide a true resolution to the very many issues involved. And unfortunately, many so called gedolim are clueless. What do you think made Reb Moishe (Feinstein) or the Lubavitcher Rebbe or the Rav (Soloveichik) gedolei hador. Certainly not just their knowledge of an obscure Tosphet. >>> Did Moshe Rabbeinu do this? Did the great prophets? The tannaim, amoraim, geonim, rishonim, etc.? I don’t know much about Moishe and the prophets, but I can assure you that an objective reading of the Talmud shows a group of incredible individuals who made every effort to understand how things worked in order to provide halakhic opinion. Of course their science and related knowledge was limited to what was known to mankind in general. >>> I don’t see why number #3 you reject. Because, if they (the contemporary crop of “gedolim”) truly understood and cared then the current disastrous “matzav” of the chareidi world would never have been allowed to come about. The idea that people shouldn’t work and that every single married “yunger-maan” should sit and learn is preposterous. Oh, so "the kabbalah" came and overrides all the gaonim and rishonim. I get it! So which "kabbalah" exactly are you referring to? Some concept you can point to or just an amorphous notion which hovers in the clouds? It shows quality leadership when the Gedolim, based on the actions of askanim who are revealed to be crooks, give a Psak that is so utterly incomprehensible and contrary to Torah scholarship that multiple people have to consult with them to find out what they could possibly have meant, and come out with multiple different interpretations? Then it was right, but now it is wrong. We are talking about whether Chazal, when speaking about the motion of the sun and other such things, were speaking about the physical world, or mystical concepts. The Rishonim ALL held that they were speaking about the physical world. The Gedolim say that such a view is kefirah. Now the claim is being made that the Gedolim are guided by hashgachah to say what they said. To which I responded that were the Rishonim not also guided by hashgachah? So now you are claiming that during the time of the Rishonim, they were correctly guided to say that Chazal were speaking about the natural world, but now we are correctly guided to say otherwise?! Chazal either were speaking about the physical world or they weren't. That can't change depending on what subsequent generations say. Sorry to digress and talk about the article, but I am completely shocked by R Tam's comments in Sefer Hayashar, and the implications thereof: ignoring the science, but that meant that for most of the past millennium K'lal Yisrael was keeping a z'man based on a shita that according to nearly all Rishonim, as well as apparently the gemara, was rejected. Kabbala is about raising one's spiritual level. The importance of Halacha is played down by Kabbala. In the realm of Truth, there is no legalism. Systems are to lift man up. They loose primacy when they are succesful, though Halacha remains binding. In this light, it is dramatically sad that Kabbala is used to justify the spread of Psika to the realm of Truth. ben Uziel - You have not read biographies, you have read hagiographies. Reb Yaakov Kaminetzky’s son spent 2 decades compiling a biography of his father, Reb Yaakov, but it was banned because it had biographical and factual information in it that was not in line with what the kanaim and askanim in power (the ones who manipulate the gedolim) want people to know about “The Gedolim”. -juggling multiple priorites, dealing with communal issues, psak halacha, etc. consistently throughout the years (and being respected and commended for their jobs well done) are acts of mesiras nefesh and proclaim their “good leadership, wisdom, and reliability”. If you knew about their numerous acts of chesed performed day and night, and were not so pessimistic and cold toward the great chachomim in our dor, you would conclude differently. I know of people who are involved in chassadim day and night, juggling multiple priorities (sometimes even with jobs!) as they deal with communal issues with tremendous acts of mesiras nefesh, but they are not “gedolim” – they are just good Jews who do lots of chesed and are osaik b’tzarchei hatzibur. They also don’t get all the kavod that gedolim do. Perhaps they should look into getting a promotion to “gadol status” as they seem to have your list of qualifications for obtaining the title and status of “gadol”. Instead of answering each of ben Uziel’s many claims, perhaps the simplest answer is that he is using a different epistemology than the one used by Rabbi Slifkin as well as most of those who regularly follow this blog. Rabbi Slifkin - I very much enjoyed reading your monograph. It was excellent. Thank you. PS - When will we see a compilation of your essays in book form? My position is being misrepresented and people are attacking straw men. I will show in the upcoming couple responses the ignorance and factual and logical mistakes being made. Let’s start with elemir. -have you ever read the river, the kettle, and the bird (Feldman)? Or bayis hayehudi, or kuntrus l’chasanim (wolbe), or v’haya shalom b’ohalecha (Friedlander), or any others? Some of them even have scientific studies from secular journals about the nature of women, aside from brilliant psychological and experiential facts. -and the gedolei hador don’t consult with expert physicians nowadays to pasken the most difficult medical shailos? The chazon ish worked with neurosurgeons, rav elyashiv and I think everyone else hold that whatever is the accepted view in medicine is how one should follow – and if not, they are negligent. This includes getting your kids vaccinated even though the viruses aren’t so common anymore, and even though there’s a potential (though small to none) sakana with the vaccination. -I think the reason for the psak *is* because they truly understand and care for the well-being of the klal. Also, “disasterous” is for sure an exaggeration. Perhaps you should have said “fragile”. All the best. If you're citing Rav Feldman, I would point out that (a) he is by far the most worldly of the Gedolim and (b) he clearly was unaware of the views of many Rishonim in this matter, not to mention (c) for months he was telling me that the ban was a disastrous mistake, and he only changed his mind as an act of devotion to Rav ELyashiv. And with regard to your comment about them consulting experts - halevay that they would do that in all cases. For example, to find out whether spontaneous generation really does take place. Oh, so "the kabbalah" came and overrides all the gaonim and rishonim. I get it! So which "kabbalah" exactly are you referring to? Some concept you can point to or just an amorphous notion which hovers in the clouds? -first off, it is not “all” (for instance shita mikubetzes in kesuvos 13b justifies Rabbeinu Tam’s position on pesachim 94b). and it is not that it overrides them but rather since kabbalah came about through hashgacha (as essentially nothing is accidental), it simply has led to the conclusion that such views should not be held lechatchila anymore. Again, and I keep repeating myself: The revelation of kabbala has given us a new dimension into the wisdom of Chazal's scientific statements - that they could be based on kabbalah. This view has gradually become more widely accepted amongst the majority of Jews throughout the world. Therefore, the conclusion of today's leaders is that the power of many of the previously held views of Chazal's scientific statements (made by various Rishonim and Acharonim) has slowly dwindled. However, they may be relied upon b'shas hadchak (kiruv for example), but cannot be held by the Jewish community at large. Secondly, the kabbala I’m referring to is precisely that – the whole of kabbala. You MUST be joking. It shows quality leadership when the Gedolim, based on the actions of askanim who are revealed to be crooks, give a Psak that is so utterly incomprehensible and contrary to Torah scholarship that multiple people have to consult with them to find out what they could possibly have meant, and come out with multiple different interpretations? -I think you are missing the big picture. First off, to conclude that their leadership is strictly based on askanim (and that they are crooks) is a narrow-minded statement, taking things out of context. Secondly, it is not utterly incomprehensible but rather not entirely easy to grasp for many people. And contrary to torah scholarship? They are indeed using torah scholarship to determine what is permissible and what isn’t! I didn't say that their leadership is strictly based on that. But in the case of my books, as well as Making Of A Gadol and several other cases I know, it certainly was. Secondly, it is not utterly incomprehensible but rather not entirely easy to grasp for many people. Such as Rav Aharon Feldman, on the Moetzes Gedolei HaTorah, who had to fly to Israel to meet Rav Elyashiv to find out what on earth the basis was! And contrary to torah scholarship? They are indeed using torah scholarship to determine what is permissible and what isn’t! I have been demonstrating, using Torah scholarship, that their view is mistaken. I thought that you were claiming that it doesn't matter if it is contrary to the normative view amongst the Rishonim, since they have hashgachah to override them (whatever that means). Now you are claiming that their view is consistent with Torah scholarship? If so, I would like to see someone demonstrate how! The revelation of kabbala has given us a new dimension into the wisdom of Chazal's scientific statements - that they could be based on kabbalah. And yet many Acharonim who lived AFTER the revelation of kabbalah, and accepted kabbalah, felt that it did nothing of the sort. So there is certainly no necessary link between accepting kabbalah and saying that Chazal were infallible in science. So even if this view became widespread, there is no reason for everyone to accept it. -the depth of chazal’s wisdom can reveal deeper concepts. In this case the kabbalah helped reveal a different pshat. -because we are aiming for a unification of what our approach to chazal should be, and since they determined what they determined, it becomes unacceptable lechatchila. Back then it was fine. So now you are claiming that during the time of the Rishonim, they were correctly guided to say that Chazal were speaking about the natural world, but now we are correctly guided to say otherwise?! Chazal either were speaking about the physical world or they weren't. That can't change depending on what subsequent generations say. -again, since we are aiming for a unification of how we view chazal, we have been guided to conclude differently for the sake of unity in how we view chazal. That’s all. -how do you know he changed his mind as “an act of devotion to…”? -I like rav dessler’s pshat, that it’s not nikar b’ayin. -I don’t know for sure. but you can’t ignore the fact that it’s not that some gedolei torah signed, but virtually all. That should tell you something. -he probably went for other reasons. He could’ve just called him up, no? he went to *clarify* it because so many people were likely to be tempted to take it out of context. -not because hashgacha overrode them, but because the hashgacha worked out in such a way as to bring a new perspective of chazal into the picture, and they weighed out the views accordingly, with the usage of torah scholarship (by taking the big picture into context) and principles of psak halacha. *That* is the process of true scholarship. -first off, there are instances where chazal are fallible in science, obviously – but not across the board, and even when it seems they are, there could be underlying deeper reasons why they said so. Secondly, as I said before, it was a gradual transformation after the revelation of kabbala – gradual acceptance, not a general acceptance across the board, until more recently at least, apparently. -no. there was a tremendous amount of solid daas torah that went into this decision. you have not done justice to this decision. at any rate, this has no bearing on the main issue of whether reb natan’s positions are lechatchila nowadays. -baruch hashem for such people. See irving bunim’s biography, and moshe sherer’s. and hopefully we’ll see reb naftali neuberger’s as well some day. true leaders, true odom gadols, but they aren’t on the madrega of a major gadol batorah that can pasken for klal yisroel. We need the serious torah scholars – they are potential leaders. - their decisions were based on a thorough consideration of the situation, and hashgacha led certain rabbonim (again, we are looking for leaders of *not* a community, but *all* of jewry) to decide as such. -I think we all have the same epistemology, as you call it. The difference is that we each have a personal preference as to how to weigh the evidence and facts. I weigh it one way, you way it another way. V’haemes nederes – the truth seems hidden, but you claim it's one way and i claim it's the other way. but only HKBH knows it. we'll see in the olam haemes. There's no way that you can make this compatible with the view of the Rishonim. we are aiming for a unification of what our approach to chazal should be, and since they determined what they determined, it becomes unacceptable lechatchila. Back then it was fine. It's not unification when you claim that all the Rishonim fundamentally misunderstood what Chazal were all about, mistakenly leading many Rishonim and Acharonim to conclude that Chazal were sometimes mistaken. And, again, you can't say that back then it was "fine" to misunderstand what Chazal were all about and to mistakenly conclude that they were mistaken. you can’t ignore the fact that it’s not that some gedolei torah signed, but virtually all. That should tell you something. It certainly does! It tells me that the whole system of Charedi Gedolim is in deep trouble. No, as he told me, he went to Israel solely in order to consult with Rav Elyashiv and Rav Steinman (and to visit his tailor). He couldn't reach Rav Elyashiv by phone or fax because the kannoim blocked him. the hashgacha worked out in such a way as to bring a new perspective of chazal into the picture, and they weighed out the views accordingly, with the usage of torah scholarship (by taking the big picture into context) and principles of psak halacha. And yet, as I have discovered, they aren't even aware of the views of the Rishonim and Acharonim, and when confronted with them, they panic and claim that they are forged. Do you have any examples of "Torah scholarship" being used? Where is the halachic teshuvah, which weighs up the sources? -I think you are correct. But the view of the rishonim cannot be held anymore lechatchila. -no claim is being made that they misunderstand chazal, but rather – once again – their views cannot be relied upon lechatchila. -don’t see how that follows from what I’ve be reiterating over and over again since the beginning of this whole shakla v’tarya. Fakert, it shows the whole system is consistent and helping protect klal yisroel from hashkafic troubles. -ah so it wasn’t just for you, but to visit a tailor and rav Steinman as well! -you can’t say that everyone or even more of the leaders are unaware of these views, and that they panic and claim they are forged (maybe some of them do, but until you go to all of them you can’t know for sure). the halachic teshuva? It’s simply the seichel of the leaders – I’m not saying I agree with every leader across the board, but just that most probably the majority of them have judged the situation with their vast knowledge of shas, poskim, etc. and their myriad of life experiences dealing with issues pertaining to the klal. Stop weaselling out of this. This is exactly what is being said. The Rishonim said that Chazal were speaking about the sun going behind the sky at night. The Gedolim are saying that Chazal were not speaking about the sun going behind the sky at night. Hence the claim is that the Rishonim misunderstood Chazal. (except that the Gedolim are not even aware of the views of the Rishonim). He went to Rav Steinman to ask him why he signed on the ban. The tailor, I admit, had nothing to do with me. I have lots and lots of evidence supporting that conclusion, and none at all against it. the majority of them have judged the situation with their vast knowledge of shas, poskim, etc. and their myriad of life experiences dealing with issues pertaining to the klal. We are going in circles here. As I keep saying, I don't believe that they have any knowledge of this sugya in terms of the sources in Rishonim and ACharonim. Nor do they have knowledge about how the klal relates to it - they swallowed Tropper's lies about my books driving people off the derech. Rav Aharon Schechter has no idea that in his own kollel, one of his senior avreichim is extremely disturbed by these topics and found my books to be a lifesaver! -I am simply responding to your continuous misrepresentation of my position. So please stop twisting my words, and I will stop responding. Once again, the claim is that the rishonim have not misunderstood chazal, but rather have a view of chazal that is no longer the lechatchila way to view them. -ok, but before concluding anything that smells of avak lashon hara, lashon hara gamur, motzi shem ra etc. I would wait for proof, at least that is what halacha calls for. Even if it is the case, I would post it in a sensitive way that doesn’t make anyone look down at people who are torah observant. regardless, it has no bearing on the issue we are dealing with, that the ideas are not lechatchila anymore. - no circles here. I was simply referring to their *overall* knowledge – b’kiyus and b’iyun, in general that is, not every single place. Again, as I said before a talmid chachom is defined as knowing *rov* torah, not all. I don’t want to get into tropper – he is not relevant to the main point, which is that these views are not lechatchila (regardless of whether people were going of the derech – maybe at least it caused some to have emuna crises, or weaken their avodas hashem. Rav Hirsch himself even writes about a similar phenomenom that comes from learning science!). ok, so for some people they are a lifesaver – some individuals for sure can benefit from them without it affecting their general avodas hashem or emuna, which is precisely the shas hadchak. I know people, even rabonim who support your work, but I also know people who were affected negatively. It’s not your fault. You are doing excellent work. It’s just that most people out there could potentially be affected negatively. Same with the gedolim books that were banned. Once again, the claim is that the rishonim have not misunderstood chazal, but rather have a view of chazal that is no longer the lechatchila way to view them. Why is not no longer the lechatchila way to view them? Because the revelations of kabbalah have allegedly shown that Chazal were not speaking about the sun going behind the sky at night (or that the sun really does go behind the sky at night). Whereas the Rishonim said that Chazal were indeed speaking about the sun going behind the sky at night and were mistaken in this belief. Hence the Rishonim misunderstood Chazal. one more time. the rishonim's view is still valid even nowadays, but it is not ideally the preferred way to view chazal anymore. therefore, to hold like them is not permitted unless, as i've explained before, certain conditions are met (i.e. the shas hadchak scenario, which of course a rav must determine). incidentally, my rav said it's fine for me to read. I think this exchange illustrates one of the dangers of kabbalah. The contention is that there exists some sort of kabbalistic explanation for certain problems. Does anyone know it? No, not really. But it exists. Three people know it. Of course they're Mekubbalim - no one knows them as phenomenol talmidei chachomim, but they're the last Jews who know the true explanation of the Gemara. They'll never share it, and even if they would, we'll never understand it. But hey, it exists. No recognized talmidei chachomim ever claim to know what the explanation is, nor do they share it. Just obscure people who may or may not know how to learn a blatt Gemara. Maybe that guy who sells yeshuos in Flatbush out of an office knows the true explanation. Even if the way I wrote that was too derisive, this is precisely what is being posited. Isn't it clear that this needs to be rejected as implausible and damaging to, well, the intellect? -i replied to this but it wasn't posted. it's important to post my reply. I lost a bunch of comments, I don't know why. Please re-submit. And please use a pseudonym, if you are too afraid to use your real name. -this is entirely false. the great leaders know, which is why the paskened the way they did, but you don't know obviously. and neither do i exactly know. i am just stating what i've heard directly from various leaders. Mekubbalim - no one knows them as phenomenol talmidei chachomim, but they're the last Jews who know the true explanation of the Gemara. They'll never share it, and even if they would, we'll never understand it. But hey, it exists. No recognized talmidei chachomim ever claim to know what the explanation is, nor do they share it. Just obscure people who may or may not know how to learn a blatt Gemara. Maybe that guy who sells yeshuos in Flatbush out of an office knows the true explanation. -most of us are not ready to handle the xplanation. our history is replete with great leaders not revealing the true reason behind a psak for various reasons (e.g. they don't want it to be misunderstood, or the person may not be emotionally ready to handle it, or the person may disagree illogically and not accept it, etc.). i've heard stories in the name of rav yeruchum levovitz ztl and elchonon spector regarding this idea. -not if you know the truth behind. and since you or myself are not leaders and chachomim, we can't make conclusions ourselves, but simply rely on their daas that is in general way above our puny level. So your approach is basically "They are the Gedolim so they must be right, regardless of their view being incomprehensible and apparently contradicted by all the Rishonim." I'd find that easier to swallow if you were able to demonstrate that they actually have expertise in this area. But all my information points in the opposite direction; they were completely unfamiliar with the sources. So why exactly do you think that your view is convincing? -no. one more time. while the rishonim's view is not the preferred way anymore, they are not mistaken and it is still permissible for individuals to maintain their views (the klal can't though as a general rule, but again if you ask a shaila then you might be the shas hadchak. i myself asked and can read them. btw, while i think your writings are excellent in general, the fact is that the leaders have decided that it's safer for the masses to not have access to these ideas, except in certain situations, e.g. kiruv purposes.) there's no contradiction, ideally we should view chazal differently nowadays (for reasons i have already revealed, and i'm sure there are other reasons out there as well), but in certain situations it is permissible to view them like the rishonim did. "Our history reveals that our leaders are part of an ongoing process of striving for a unified corpus of halacha." -- Ben Uziel, Post #8. That is the first appearance, but it repeats endlessly among the Gentlemen on the Right. Apparently, the Right has decided we poor Lefties no longer have a right to dissent from their insanities. Ai, there is a grand tradition of dissent in Judaism? Ai, we can barely agree on anything anymore? No! We must have unity. We must have a unified corpus of halacha. And somehow that means something to the effect of "Everyone Must Conform To My Opinion." If you do not, then you are "outside the mesora" and implicitly a bad Jew at least and a heretic at most. I suppose a more accurate description of the opinion is "You Lefties Will Be Assimilated By The Chareidim!" Perhaps it is time for those who want a unified corpus of halacha to realize that large parts of their Anglo-American brethren are sick and tired of Israeli nutcases telling us we are lamentable sinners. If they want "unity" so much, maybe they should compromise and agree to tolerate our opinion. Why should we have to bite our tongues to please the Israeli Zealots? Is our opinion so radical? Not really. We have as many Rishonim and Achronim as the Right. Is it so heretical? If it is heretical, then we shall all burn in such good company, and proudly too. Will it hurt the Right? But we Lefties, out of our great love of liberty, cannot stand to shove anything down anyone's throat. I do not think Rabbi Slifkin will ever insist that the Chareidim teach his book in their schools. I personally think it might shock some sanity in, but I would never insist on it either. We are more than content to live and let live. Rabbi, I see this argument as a battle between sanity and fanaticism. Thank you for having the courage to keep up the good fight. You're just saying the same thing again, which does not shed any light on your position. If the Rishonim were not mistaken, then why is it preferred that we don't adopt their view? If you're saying that it's socially harmful, I fully agree and have said as such many times. But you were claiming that it's because the revelations of kabbalah have shown otherwise - WHICH MEANS that the Rishonim were mistaken. -this is irrelevant, because, once more, it's about what the leaders deem the most appropriate perspective of chazal *nowadays* (based on various factors, not necessarily the number of previously held views from the rishonim's time). josephus - if you know history, you will see an ongoing process of halacha k'so-and-so, etc. i've said this before. >-this is entirely false. the great leaders know, which is why the paskened the way they did, but you don't know obviously. and neither do i exactly know. i am just stating what i've heard directly from various leaders. Really? Have you ever met any recognized Torah scholar who claimed to know the inner meaning of these ma'amarei Chazal? In fact, as far as Kabbalah in general, the almost universal position of Torah scholars is to admit/ acknowldge/ claim/ boast that they personally have nothing to do with Kabbalah. >most of us are not ready to handle the xplanation. our history is replete with great leaders not revealing the true reason behind a psak for various reasons (e.g. they don't want it to be misunderstood, or the person may not be emotionally ready to handle it, or the person may disagree illogically and not accept it, etc.). i've heard stories in the name of rav yeruchum levovitz ztl and elchonon spector regarding this idea. You can't handle the truth is your response? There are few examples of great leaders not explaining their pesak, not so many, and often you can tell why they're taking the position anyway (e.g., Divrei Chaim's opposition to machine matzos). >not if you know the truth behind. and since you or myself are not leaders and chachomim, we can't make conclusions ourselves, but simply rely on their daas that is in general way above our puny level. Can you give me the name of someone that you know for a fact knows the penimius, the inner kabbalistic meaning of the kinds of things we're discussing here? Okay, this is going nowhere. You claim that they are the leaders of all klal yisrael and the experienced experts who have reasons that they have not revealed and who can weigh up all the factors. I say that they are none of the above. The difference between us is that I can provide evidence to back up my claims. It seems futile to enter into a rational debate with people who aren't willing to view the subject rationally. Read the sugya in question (T.B. Pesachim 94b). Rebbe (R' Yehuda Hanasi) is the one who comments on the debate about the presumed path of the sun at night, and agrees with the view of the Gentile sages that it passes below the earth. Those Gentile sages were certainly referring to a physical phenomenon - not some mystical idea. So, Rebbe agrees with their understanding of the apparent physical path of the sun, and not with the Jewish sages. Further support for this position comes from Rebbe's rationale about water left overnight above ground being warmer than freshly drawn well water. It's a physical phenomenon as manifested in our use of mayim shelanu for baking matzot for Pesach. In truth, however, Rebbe's rationale is incorrect in that it implies a flat earth. We know, however, that the earth is spherical and that sun's apparent motion merely carries it around the earth in a 24 hour cycle (of course, we also know that it is the earth that spins on its axis in a 24 hour period rather than the sun moving around the earth daily). The modern understanding of the relative warmth of the fresh well water is due to the vast heat capacity of the underground environment of the water springs. That serves to keep the spring water at a reasonably constant temperature throughout the year. In contrast, the air temperature in the winter and early spring is cooler in the mornings due to lack of solar radiation and radiation heat loss from the ground. Hence water left overnight in an unheated area will be colder than the spring water. The last point can be used to understand other apparent conflicts between what the talmudic sages have written and our modern knowledge. We should pay less attention to some of their rationales than to the halachot themselves. The halachot may be well-based, as well as authoritative, even if the given rationale is not correct. Thus, the rationale given for killing lice on shabbat is incorrect, but the halacha was formulated long before the particular rationale of Rav Yosef was given. This stance was apparently first enunciated by Rav Dessler. The Talmud in the second chapter of Chagiga contains many passages which refer to the "Rakia" as a metaphysical entity. The commentary of Ramban to the verses about the creation of the "rakia" is similarly referring to a metaphysical entity. I submit that the Maharal's and Ramchal's approach to the identity of the "rakia" is not as revolutionary as you make it out to be. Can you provide sources please. Ramban to Bereishis 1:8 seems to interpret the firmament in terms of Ptolemaic spheres. But it's not relevant what he thought the Chumash meant; it's what he thought Chazal meant that is relevant here. And I don't think that we have anything from Ramban on the topic. Y. Aharon - you are trying to make it seem impossible that there is any deeper meaning, but that is only because you don't know what it is (and neither do I, but I don't conclude that there definitely is no deeper meaning). By the way, see R. Akiva Eger on that gemara, that Rebbe was saying "v'nireh li..." and also shita mikubetzes to kesuvos 13b, defending rabbeinu tam. "do not malign the words of a sage even if they may seem trivial, for they contain the lofiest wisdom" says the Gra (Bava Kama 92b, "shapil v'azil bar..."). That's right, the Shitah refers to Rabbeinu Tam's view that the sun really does go behind the sky at night. Are you saying that you believe that to be true? "do not malign the words of a sage even if they may seem trivial, for they contain the lofiest wisdom"
Are you saying that the Gra was criticizing all the Rishonim and Acharonim in my essay? Wow! This is really enlightening. First Rabbi Slifkin's comment: "There's no way that you can make this compatible with the view of the Rishonim." There you have it. Throw out all the halacha books and all the hashkafa sources from the medieval period because lechatchila Judaism no longer believes in them. Wow, we have a new reform movement on our hands! What else will they reject and throw away in the name of being an adherent of "daas torah" religion? I am finished discussing this issue, as I see that you are consistently misrepresenting my position and that you are no longer interested in hearing the clarification of my position. Perhaps you will be enlightened and perceive the truth by calming down first, and then having an intelligent conversation over the phone or in person with a Gadol about these issues. If you cannot do this, I'd recommend a therapist. Have a great day/night. ben Uziel, there is little point in speculating about a possible mystical interpretation to the issue of where the sun goes at night. I don't require it, and you admitted to not knowing it. I only alluded to the fact that Rebbe mentions the differing views of the Jewish and Gentile sages on the matter, and states that he prefers the latter view. He must be referring to the actual path of the sun since that was certainly the position of the Greek naturalists. Whatever else he or the Jewish sages may have had in mind, the evident meaning of their words must also be intended. By the way, the phrase, "venirin divreihen midevareinu" that Rebbe uses doesn't mean that "they are apparently correct" (but not really). It means, "I prefer their view and not ours" for the following reason ... It is merely a polite way of saying that my rebbe'im were wrong. While Rabbenu Tam as cited in the Shitah Mekubetzet may believe that the Jewish sages were really correct in this case, Tosafot in Eruvin 76b state and demonstrate that R' Yochanan in that sugya and the conclusion of the Gemara in Succah 8b made a mathematical error which has halachic significance, or misunderstood the geometric rule of the Caesarian sages. A mathematical error with halachic significance is not something that can be rationalized by saying 'nature changed', or that 'it's only an approximation'. As the Gemara in Succah states, 'lo dak' is not an acceptable argument if the deviation from the accurate value is substantial, or if the approximation results in a leniency. I do not understand how we can ignore the opinion of the majority of the Rishonim and many of the most important Geonim (who where even closer to the Tanaaim and Amoraaim) and except that we can now change our understanding of early chazal. Our Judaism is completely based on Mesorah handing down from one generation to another - hence the important first Mishnahs of Pirkai Avot an unbroken chain to the point that we venerate and as a rule can't argue with earlier sources and now some people want to say we should not accept their opinions and create an entirely new understanding of the Gemorrah (and which also happens to be opposite to the obvious meaning)? Can you site any other sources for what the ancient Babylonians believed regarding the fixed sphere? Cosmas Indicopleustes according to wikipedia was primarily a merchant not an astronomer so I dont think you can use his opinion alone as representative. Also can you explain or point me to a source which explains how the Babylonians believed the stars moved? I can understand the Ptolemaic system where the stars were fixed on a sphere and the sphere moved but how did the stars move according to the Babylonians and what was the function of the sphere? Anonymous, I'm encouraging R' Slifkin not to post any more posts by anyone going by "anonymous." Also, I suggest you learn how to use the HTML tags. Regarding Chazal/Science, the Rambam in the Moreh 2:8, is brought as a strong support to one side of the issue. However, I've recently seen it argued that this was only because Chazal lost a Mesorah, as in Hilchos Kiddush HaChodesh 17:24(R. Kapach also references the Rambam in KH in footnote 9, see link). Does anyone have a response to this counter-argument? Also, the Torah HaOlah, I would assume understands that the Rambam in KH is not making the same point as the Moreh, as he does not quote the former when disagreeing. -ha! That’s a good one. You vs. chazal – don’t think the match is fair. -of course not, just that in general we must be careful in matters of agadata. As you analyzed in your paper, according to the maharal the main intent of chazal here was the spiritual/metaphysical dimension (while the majority rishonim focused on the physical side of things, the revelation of kabbala began refocusing our view of chazal, especially in matters that aren’t halachic in nature). Take care. it was nice chatting with everyone. all the best to you. bye now. R. Slifkin, I do not see the point of your extended interchange with anonymous/mr ben Uziel. If merely to educate us yet again to the existence of such perspectives, that was accomplished early in the exchange. Simply accept that Mr uziel lives on a different epistemological planet than you do, one whose residents acquire their “knowledge” by other means– basically by crediting truths enunciated only by a designated set of "experts". “Knowledge” acquired by such ex cathedra means will always remain quite impervious to either doubts, logic, experimentation, or coffee and there is no point in continuing to question it, even if a more conventional epistemology might marvel at what, in its different frame of reference, appears to be a stubborn display of invincible ignorance. Nevertheless, Mr Uziel’s commentary, if truly representative, remains valuable as a matter of anthropology and I did indeed learn something new. and that is the – astonishing to me – claim that the true knowledge possessed by its authoritative enunciators (ie the “g’dolim”) is theirs through the auspices and their mastery of qabboloh. Set aside the notion of how substantively preposterous such an assertion might be - trying to reason with this sort of stuff is quite futile. But, it’s been my understanding, the class of present day litvish g’dolim who are the sources of Mr Uziel’s “knowledge” have traditionally - emulating the chasam sofer - entirely denied any involvement with qabboloh (a common phrase, ain lonu eiseq b’nistoros). Has that now changed and is it the common charedi man-in-the-street wisdom that their leadership are now committed and deeply expert qabbolists? Inquiring anthropologists want to know. Sorry to bring the discussion back to the actual paper, but have you had a chance to see Tosefot Rid's approach to Rabbeinu Tam. (Shabbat 35b) As I mentioned, it is clear he felt that it is not predicated on the Sages of Israel's interpretation. Sorry for somewhat reposting, but it seems my comment got lost in the middle of the other argument. "claim that the true knowledge possessed by its authoritative enunciators (ie the “g’dolim”) is theirs through the auspices and their mastery of qabboloh." To be fair, I do not think that this is what was said. It is more like this: The gedolim think they know that masters of Kabbala claim that Chazal referred to spiritual matters when they seemingly erred in earthly matters, and the gedolim accept this position. Regarding the Sun going behind the Rakia at night, Chazal were quite obviously trying to make a Hakbala between physical reality and the spiritual insight that there is One Source. They thought that it had to be that the light of the stars is in fact light coming from the Sun, piercing through small holes in the Rakia, when the Sun is behind the Rakia. Many Talmudic attempts to make a Hakbala of this type are wrong, as is this one. However, in the case of the Sun, there is in fact a valid Hakbala. The Sun is also a star. There is one light source: Nuclear Fusion. Chazal would have been delighted to learn this. To be more precise: He notes that while Rabbeinu Tam predicated his approach on the Sages of Israel's interpretation, he himself did not feel that it has to be that way. > the Kohanim from that period were primarily Tzadukim (see Tosef., Yoma 1:8). Are you suggesting that today's leaders are in the same category? You say that as if the Tzedukim were some degenerate form of Judaism, and their leaders were rishoyim – unlike the holy and pious current leaders of Rabbinic Judaism. In reality, the tzeduki and perushi versions of Judaism developed alongside one another and were, at the time, equally legitimate. The argument could even be made that the Tzedukim, who were the aristocratic leaders of the kohanim and the people who were responsible for the important religious rituals of Temple-era Judaism, held the theological high ground. In the 1930s the rabbonim of Europe railed against the “traife medina” and encouraged their communities to stay despite the threat of an ever-more powerful and virulently anti-Semitic Germany. > -I’m not such an historian, but people are human, and fallible. *But*: that doesn’t mean we dismiss the views of great minds in every situation. Of course we don’t dismiss their views out of hand because they made a mistake. But you asked for an example of “questionable decisions” from “leaders in our history were not tzadukim.” The European rabbonim of the ‘30s certainly qualify. > “honest working man denigrated?” that’s simply false. In the yeshivish world today, “Baal habayis” is all but a synonym for “am ha’aretz.” A statement in a speech does not negate a pervasive societal attitude. That’s great. Kavod aside, would you trust one of the gedolim to rewire your house? After all, all knowledge is contained in the Torah, so surely they know as much as any electrician! > and the gedolei hador don’t consult with expert physicians nowadays to pasken the most difficult medical shailos? I’m confused. A moment ago you were saying that secular knowledge is unnecessary for a gadol, because all knowledge is contained in the Torah. Now you’re praising them for consulting with scientific experts. > So now you are claiming that during the time of the Rishonim, they were correctly guided to say that Chazal were speaking about the natural world, but now we are correctly guided to say otherwise?! Chazal either were speaking about the physical world or they weren't. That can't change depending on what subsequent generations say. You can’t have it both ways. If Chazal were speaking about the physical world, then the current gedolim are wrong. If they were speaking about kabbalistic concepts, then the Rishonim were wrong. Either of which would be okay, except that you’re claiming that Hashem guides the gedolim of each generation to the truth. The view of the rishonim and the view of today’s gedolim are mutually exclusive. If Hashem “told” both the rishonim and today’s gedolim that what they held is the truth, then He was lying to one group. In it, Nobel Prize winner Robert Aumann uses modern economic theory to explain how an estate is divvied up between creditors. I realize that perhaps it is a stretch to claim that the economic principle Aumann suggests qualifies as "science," but I still think it's very interesting. Or the Rambam - who put all corporealists (such as Rashi ;) ) beyond the pale. Can we stop considering them as out authorities because of these actions? Justin - don't even joke about the Rashi issue. R' Slifkin has been shown conclusively to have been wrong about that. Eli, this may come as a shock to you, but an enormous number of people agree with my conclusions about Rashi - including people who are actually experts in medieval Jewish history. It doesn't come as a shock to me that you believe that. If I remember correctly, even Dr. Marc Shapiro has said that after reading the refutation of your theory written by your opponent in this issue, he (Dr. Shapiro) was pulled in that direction (the opposite of yours). I know what people have told me. What Dr. Shapiro said was that he did not know what to conclude. He most certainly did not agree with what you said - that I have been "conclusively shown to have been wrong"! What about my comment Rabbi S.? What do you say? When did I ever say, or even intimate in any way, that somebody who puts someone in cherem is ipso facto any less of an authority as a result?! It is, without question, the view of the Prushim that the Tzedukim were a total perversion of Torah tradition, something that started with Baytus and Tzadok misinterpreting the words of their teacher, Yose ben Yoezer. Regardless of whether you believe that, the Gemara Yoma also goes to great length to show that frequency with which kohanim died during the Yom Kippur avodah shows that shamayim was in agreement. Rabbi S.:"And those who follow those leaders, must follow this dictate. However, these are not the leaders of all Klal Yisrael." I don't understand what you are getting at. All I was saying was that they are only the leaders of their communities, not of the entire nation. If you want to be part of the community that pledges allegiance to these Gedolim as their leaders, then you have to follow them. But there is no reason why every Orthodox Jew has to be part of that community. I'm back for one last comment. It seems that most people here are misunderstanding gemaras, history, and unable to apply principles of rational analysis properly in communicating with me and in explaining your positions. If we could do this over the phone, or you could do it without me but with true a talmid chacham and/or posek in person, and you didn't have a bias for the new movement you are starting (and no, you are not actually defending rishonim with the proper mindset, but with an erroneous approach), then perhaps you would feel much more content about the truth of my position, and the gaps in your logic. I wish you hatzlacha and bracha. Ben Uziel, everyone else here feels that it is you that is misunderstanding gemaras, history, and unable to apply principles of rational analysis properly in communicating and explaining your positions. Furthermore, if you didn't have a bias for the new movement you are starting (and no, you are not actually defending Chazal with the proper mindset, but with an erroneous approach), then perhaps you would feel much more content about the truth of my position, and the gaps in your logic. I wish you hatzlacha and bracha. What Justin is saying is a point against Ben Uziel’s claims that the Gedolim are “are aiming for a unification” in halacha and in “how we view Chazal” etc. The list of authorities throughout Jewish history who put other rabbanim who we now consider major authorities into cherem or banned their books, is very long. Clearly this idea of a need for “unification” is an excuse. Furthermore, by “banning” the opinions of a large group of Rishonim, the Gedolim are not “unifying” Torah but splintering it. Saying that those opinions were okay for THEN but NOW it’s not okay, is hardly what could be called a “unification”. Also, I find the following interesting. “Ben Uziel” is pushing this idea that Chazal didn’t err in science because they were not talking about a literal sun, firmament, etc but were referring instead to spiritual “deeper” concepts (which Rabbi Slifkin has proven to not be the case in his excellent monograph above). But if the Gedolim like that idea, why not simply use it for the beginning of Bereishis regarding the world being created in 6 days, order of creation, etc? If you can say that Chazal didn’t speak literally and rather were relaying “spiritual deeper concepts” why not say that the Torah didn’t speak literally and wanted instead to teach “spiritual deeper concepts”? Oh, is it because the Gedolim already banned Rabbi Slifkin’s books and called the acceptance of scientific findings (outside of medical science) heresy? That’s too bad. But wait, didn’t “Ben Uziel” say that the Gedolim are only human, and that it’s possible for them to make mistakes? In that case, why don’t they just say that they made a mistake, retract the ban on Rabbi Slifkin’s books, and clarify the situation? It takes big men to admit having made big mistakes. Yet we have not seen such from the big men (Gedolim) of this generation. PS - I'm taking bets on how many more “last comments” Ben Uziel is going to make after he said he isn’t commenting anymore. What’s your bet? I say 5 more. Rabbi S.: "All I was saying was that they are only the leaders of their communities, not of the entire nation." So who must we ever follow - only someone with whom we totally agree on everything? If we don't agree with everything we automatically relegate them to "their" community? We have no Sanhedrin. If you are not qualified to decide matters on your own, then you should have your own Rav that you follow. "Maharal’s argument, that nobody could believe that the sun goes behind the sky at night, is anachronistic." Can you please explain what you mean here? I very much appreciate your source(s) and explication of them. Thanks for taking the time to spell it out so clearly. Dr. P - what I mean is that while in the 16th century, it was "obvious" that the sun goes on the other side of the world at night, this was not at all obvious in earlier times. It is a common error to project our own assumptions on earlier times. "What Dr. Shapiro said was that he did not know what to conclude." Actually what he said was that after reading your material, he was pulled in your direction, but then after reading R' Zucker's material, he was pulled in his direction. Do you deny that this is the case? And who exactly are the experts in medieval Jewish history who agree with you? Names please? AFTER saying that he was pulled in each direction, DR. Shapiro concluded by saying that "I don't think Slifkin is correct that Rashi thought that God had a fixed shape. But I do think that according to Rashi God can choose to adopt a physical form, and that seems to be what Rashi is saying. But the matter is unclear." And, incidentally, I don't think that Rashi necessarily thought that God had a fixed form; I just haven't seen any evidence against that. So Dr. Shapiro concludes that it is unclear, but he thinks that according to Rashi God can choose to adopt a physical form. Thus, he most certainly did not agree with what you said - that I have been "conclusively shown to have been wrong"! Congratulations on your outstanding article, which I consider "megalgalin zchut al yedei zachai". When your article first appeared last winter, I must admit that it did not come as any chiddush to me, but it was well-presented and I gave your article a Friday night presentation in a local Charedei Flatbush shtieble, attended by 125 learned baalei-batim who were for the most part somewhat receptive. It was only from following the subsequent brouhaha that I realized the vicious nature of even non-Chareidi types when their inability to view matters objectively is exposed. I have taught a daf-yomi for many years and have been convinced for some time that Rashi's Talmudic commentary even more so than his peirush on Chumash show him to be a through and through corporealist. I've even pointed this out to my Shabbos afternoon chaburah for many years. Then Lorberbaum and Friedman articulated it for academic-types and now you've made it part of the intellectual landscape. Many thanks for all your brave efforts on behalf of intellectual integrity. May Hashem continue to strengthen your hand against all your detractors." "Zucker's bottom line defense is that although Rashi personally wasn't a corporealist (and this he concludes only after many dechukim) Rashi's audience were in fact such adherents of corporeality that had Rashi expressed himself even once (!) unequivocally on this issue (for example in his comments to Genesis 1:26, where every other parshan does) his readers would have abandoned Judaism. The absurdity of this notion should be apparent to everyone. To me this is paradigmatic of Zucker's arguments." I do NOT want this comment thread to be sidetracked, so this diversion is now closed. If you would like to pursue the matter further, you are welcome to email me, or wait for a relevant blog post. First of all, just so you know where I am coming from, I like your article very much, and agree with your conclusions. Having said that - L'Hagdil Torah U'L'Hadira - I would like to discuss this one point with you. I do not believe the MaHaral is doing what you accuse him of with regard to what you term his "anachronism". It seems you may have not looked closely enough at his words. The MaHaral seems to be raising the following issue: Since it is obvious (to anyone with a watch or clock - now we can debate when such devices became common) that when you travel a thousand miles or so (several days journey back then)your clock will show you that the sun is setting at a different time (I think 1,000 miles gives you about an hour, 500 miles would give you half an hour), clearly no intelligent observer (Chazal) could conclude that sunset represents the sun piercing through a layer and disappearing, for that would result in darkness for everyone at the same time, rather than at different times depending on one's time zone. Rather, it MUST relate to some type of curvature/horizon issue. Now perhaps we do need to discuss whether attributing a knowledge of time zones to Chazal is anachronistic. But recognize that Maharal was not guilty of simply saying "Noone could think x because everyone knows x to be false". His proof (whether you believe it to be correct or not) is much more sophisticated than that. I don't understand why you think I was saying any different. So what is the anachronism? Are you saying that the Chazal didn't realize that those living 500 miles west of Bavel were experiencing sunrise/sunset at a difference of about 1/2 an hour? And are you saying that the MaHaral DID realize this but mistakenly thought Chazal knew this as well? I don't mean to put words in your mouth - please, you tell me . . . The latter. Maharal writes that "this cannot be contradicted by any intelligent person." But plenty of intelligent people did contradict it (or rather, never thought of it). See Christine Garwood's "Flat Earth: The History of an Infamous Idea." אמרו כל רבנין אמרין לה, בשם רבי חנניה ברבי פנחס, ורבי יעקב ברבי אבין, בשם רבי שמואל ברבי נחמן, בשעה שאמר הקב"ה "יהי רקיע בתוך המים" גלדה טיפה האמצעית ונעשו שמים התחתונים ושמי השמים העליונים. 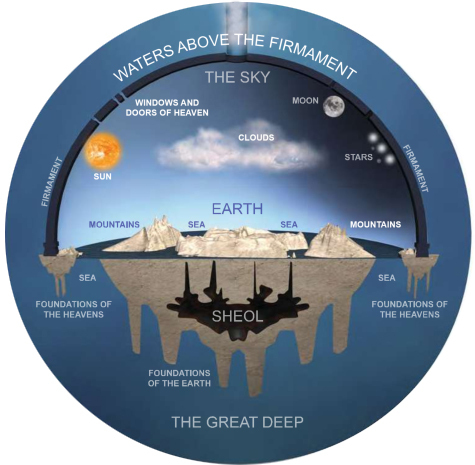 It is quite clear from all the above that the "firmament" separating the "waters of the heavens" are quite metaphysical in nature. It's clear that Ramban thought that the passuk was referring to a metaphysical construct, yes. But that was never in doubt. None of these sources have any bearing on Pesachim 94b, nor on how Ramban interpreted Pesachim 94b. When did the issue of time zones become common knowledge? Were Chazal aware of time zones? Was the Maharal aware of timezones? Well, of course. And the tzedukim no doubt held a similar view of the perushim. But the gemara was written by the descendents of the perushim, and the tzedukim seem to be conflated with the Kaarites… none of which means anything. That the tzedukim were vilified by their opponents and delegitimized centuries after they disappeared doesn’t mean they were an illegitimate version of Judaism at the time they ran the Beis HaMikdash. That the tzedukim were vilified by their opponents and delegitimized centuries after they disappeared doesn’t mean they were an illegitimate version of Judaism at the time they ran the Beis HaMikdash. To play devil's advocate: But this is our MESORAH and that is what our mesorah teaches us. Anyway, history is written by the victors, and being that the Perushim won, they got to write our history and dictate the basis for and rules of our religion for the next 2,000 years. Dr. P, Even if the sages in Judea and Bavel were aware that sunset times differed between the 2 countries, they could still speculate that the sun passed through an opaque rakia following its visible setting. The earth model that they used need not have been that of a flat sheet, but of a curved thin plate with Israel at its apex and Bavel a distance to the east. Then the horizon in Bavel in this model is such that the sun will appear to set earlier - regardless of where it goes after sunset. By the same token people to the west of Judea, i.e. in Italy, will observe the sun setting later. Of course, this assumes that they had a reliable way of telling time independent of the sun. You can check my assertion by drawing a circular arc and then tangent lines to the middle (Judea) and a point well to the right (Bavel) and left (Italy). Hence, the apparent basis for Maharal's reinterpretation can be questioned. Y. Aharon, I agree. In fact, originally, this is how I described it in my essay; I changed to describing it as flat, with Israel elevated at the center, because I couldn't actually find positive evidence for a shallow hemisphere. But they may well have viewed it that way. Thank you, I hadn't thought of that possibility. At the same time, R. Slifkin, this is a bit different than what you stated in your essay. You assumed that the MaHaral fell prey to an anachronism. Y.Aharon is stating that the Maharal should have recognized that there was an alternate explanation to what the Tannaim may have thought. In other words, after reading what Y.Aharon wrote, it seems to me that the Maharal had a good kasha - not based on an anchronism. The Maharal may have dropped the ball in not thinking of Y.Aharon's "terutz". But that does not mean that his mistake related to the anachronism. I don't mean to nitpick, but I think that not thinking of Y.Aharon's terutz is less of an intellectual blunder than totally missing the boat on how the ancients understood cosmology from their vantage point. So I think we should be fair and not ascribe the latter to the maharal when he seems only to be guilty of the former. R' Natan, I offered that curved surface model primarily as one possible talmudic model for the shape of the earth. Besides accounting for differences in sunset times - if they were aware of such, it also accounts for the talmudic statement that Israel is higher than all other lands. Now, they were aware that there were taller mountains such as the Lebanon range and Arrarat. Hence, if the statement about the height of Israel is to have physical significance, it would point to a supposition that the ground level was higher than elsewhere. It is doubtful that they believed the height to be a result of Israel being on some high plateau. After all, there was much travel between Israel and points further north. All travelers would have seen that one doesn't descend to Lebanon from Israel. Dr. P - I don't agree. Maharal considers it inconceivable that any intelligent person could believe in a flat earth. Now Chazal might have believed in an earth that was a shallow hemisphere. But there were certainly many intelligent people that believed in a flat earth! So Maharal's mention of different sunsets is not reason to assume that nobody intelligent could believe in a flat earth. Dr. P, I only offered my curved earth model as a conjecture, as I previously noted. One would have to investigate all talmudic and midrashic references to the shape of the earth to draw definite conclusions as to what the sages believed. I agree with R' Natan, however, that the conventional view is that the sages believed in a flat earth despite problems with the idea that Israel is higher than elsewhere, and the means of keeping the ocean in place. If you don't take the 'easy' course of ascribing the latter to the divine will, then you need to postulate the existence of tall mountains (even taller than Arrarat) around the perimeter of a flat(or curved)earth. Finally, your impression that I have nullified ('shlugged up') the Maharal's attempted proof could get me into trouble with Maharal adherents - one of whom is considered by R' Natan to be a prime mover in the bans, and assuming they knew my identity [I used a more circumspect language with regard to the Maharal]. Please look at the MaHaral again. He is not saying that no intelligent person would believe the Earth is flat. He is saying that since sunset takes place at different times at different locations, no intelligent person could think that the sun is piercing through a layer and disappearing, for then sunset would be at the same moment for all Earthly observers. Again, Y.Aharon has offered an answer to the Maharal - an explanation of how a reasonable 2nd century Babylonian could have reconciled time zones with the "piercing the firmament" model of sunset. And I find it to be a good answer. But none of this relates to the alleged anachronism to which you refer. The Maharal never advanced the argument that "Since we all know today that a flat earth is absurd, and Chazal were not absurd in their beliefs, ergo, Chazal cannot have believed in a flat Earth." We all know that people sometimes engage in that kind of logic; however, the Maharal has not done so over here. (And again - this in no way relates to whether or not the Maharal's thesis on this issue was correct or not). I love your article, I just think that this slight error of attributing this argument to the Maharal should be corrected. I understand why your initial reading of the Maharal may have led you to believe that the Maharal was making the simplistic argument you ascribe to him, but I encourage you to read the Maharal carefully again. Dr. P, you are correct that he is not saying that nobody could believe in a flat earth, but rather that nobody could believe that the sun disappears through a solid firmament. I didn't present it correctly in the comments here, but what I meant and wrote in my essay was that this is anachronistic JUST LIKE it would be anachronistic to say that no intelligent person could believe in a flat earth. If the earth is a sphere according to the Chachmei Umot Haolam of the Talmud, the proof of their being correct from the heat of the springs at night doesn't make sense. It is clear that the Talmud understands the argument as to if the sun goes underneath a flat disc or above a covered dome at night. This whole issue of "gedoilim" brought up by ben Uziel sounds totally ridiculous and irrelevant to me. Who decides who the "gedoilim" are? The "ketanim"? I don't know who is a "gadol" or who is a "katan". I debate ISSUES, not personalities. If you cannot think for yourself but blindly accept the dictates of your "gedoilim", then let them speak for themselves and you keep your mouth and pen inactive. Regarding the Kabbalah, I refer you to "Ma'amar HaIqarim" by R.Moshe Hayyim Luzzatto, one of the greatest kabbalists of the ages, where he writes clearly that often when Hazal wrote about scientific issues, they were only using them as allegories to convey deeper Kabbalistic ideas that could not be written openly for general consumption; but if they lived in more modern times when other scientific views were accepted, they would have used those newer views as allegories instead. Indeed, in one of his Kabbalistic works, he says clearly that a certain scientific statement in Hazal is false, and goes on to explain in kabbalistic terms what they really were trying to convey. Great article. Can you point me to any sources like this in Hebrew? I would like to share it with some non- religious Israeli friends of mine who would like to understand more about What Chazal knew about astronomy , and the normative halachic understanding of their knowledge. I want to ask a different sort of question to Rabbi Slifkin and anyone else who is still participating in this discussion, although there have been no postings in over a year. B) using this observation to make an existing halacha (perhaps not a rabbinic gezerah, but part of the Torah obligation of matzah) understandable to his own satisfaction, or perhaps that of his contemporaries. If it is the former, then it is difficult to understand why he would put forward such evidence--Anyone who put their hand or foot in a pond late at night or early in the morning would find it coldest at that time. If it is the latter, then can we dispense with mayim shelanu today as long as the water used is below a certain temperature? 1. There is no novelty with regard to any instance where the Sages of the Talmud clarify that they are wrong, for we know that certain Sages were experts in certain Torah subjects, or Tractates, while other Sages were experts in others. Therefore, it would come as no surprise that any given Sage would be uninformed in some specific subject. This only serves to reinforce that, as long as the Talmudic Sages leave no room for doubt, they are sure of their words, and they are immutable, while those times when their statements are not divinely inspired, they let us know, as was done here. 2. Given that Rambam cites a different version of Rabbi Yehudah, this gives rise to the legitimate question of whether this discussion was censored (differently in different editions) by those who follow the nazarite, or if someone who knew of the censorship but didn't know the original text left a clue behind for us. Should this be a case of censorship, the later Rabbis who have taken every attempt to uphold even what may turn out to be a censorship, only shows highlights the message that the words of the Sages are so true (unless they leave room to maneuver) that even when it goes against everything we know, in the absence of evidence to suggest censorship, one must err on the side of caution, because the confidently inspired word of the Talmudic Sages is infallible, unless otherwise indicated, such as in this example. Footnote: I have not reviewed this subject on any comprehensive level, but nevertheless, the above points are of value. NS: I am sorry that you have banished yourself from among many of your brethren in the pursuit of (possibly falsely) undermining men who's greatness you will never come to. "most people just skim through it with little comprehension"
I respectfully posit that that's not a fair statement. How can you assume something negative about other people? Let's be dan lekaf zechut and only say something negative about others that we know.